Merrily Watkins is in her thirties. She's a single mother, and she's the parish priest of Ledwardine, a small village in Herefordshire, England. And-- after the events that occurred in The Wine of Angels-- she's been approached by the new bishop to be a Deliverance Consultant. It's a job that's viewed with so much suspicion by the Church of England that it now goes by this kinder, gentler name instead of the old title: Diocesan Exorcist. Although she has misgivings as to her ability, she wants to do good, to make a difference, so she goes on the training course. The training course gives her more doubts because even the instructor believes that it's not a job for a woman, but when she returns to her own parish, she has to hit the ground running. A seemingly unending stream of phone calls demand her help with some very strange goings on. The current Deliverance Consultant, a curmudgeonly old man on the verge of retirement, is not about to give her even a molecule of help, and neither is the bishop. The bishop, a handsome, self-assured political animal, wants to see if she's got the right stuff. Even her sixteen-year-old daughter Jane is bent on rebellion, not help. When I read the first book in this series, I fell in love with the setting and the atmosphere that Rickman created as well as his characters, but I had a bit of a problem with the length of the book (over 600 pages). When I picked up Midwinter of the Spirit to read, I didn't even remember the quibble about the previous book's length. All I remembered were the characters, the setting, and the atmosphere. That's all I needed to remember. At over 500 pages, this book isn't lightweight either, but I didn't care. Not one jot. I immediately fell into that setting-- the ancient buildings, the centuries-old traditions, the feeling that the past is always with us-- and Rickman's wonderful characters. Merrily with her self doubts and her real need to do good... her infuriating and lovable teenage daughter Jane... the self-effacing Lol Robinson... they had all been indelibly imprinted on my mind from reading the first book, and I felt as though I were renewing acquaintance with old friends. I dove headlong into the story and grudgingly came up for air only when real life demanded that I do so. I know many readers who do not care to read about the paranormal or the supernatural. I used to be one of them. One of the things that I love about Phil Rickman's Merrily Watkins series is that so much of the supernatural is implied; you can choose just how deeply you want to go into the story. 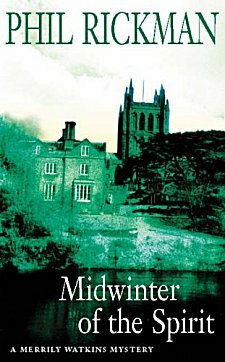 It would be easy to read Midwinter of the Spirit and pay little to no attention to the supernatural elements. The motivations of the characters are no different: greed, jealousy, ambition, and Rickman certainly knows how to put together a plot by interweaving all these characters and all these reasons to cause harm. Characters, setting, plot... and the delicious eerie atmosphere that can cause a tingle... or the hair to rise on the back of your neck. Wonderful! If you're in the mood for a rich, meaty, slightly spooky read just perfect for Halloween (or any other time of year), I can give you a tip: get your hands on one of Phil Rickman's Merrily Watkins books. Chances are, once you've read one, you'll be reaching for more. Can you read the books out of order? Yes, you can, but character development is key to the series, and I would advise against it. Why deny yourself the pleasure of reading Merrily from the beginning? Cathy - I'm drawn in by the atmosphere, by Watkins' profession, by the whole concept. I'm not normally one to reach for a long book any more unless it's a really absorbing 'keeper' but this one seems to be. Thanks. I actually like long books. I used to automatically reject anything that even sniffed faintly of paranormal, but Linda Gillard cured me of that. Now I still reject vampires and such, but I think I would like Phil Rickman's books. I'm sold. I don't have anything against long books, but in this case I thought there was too little happening to justify all those pages. But it left a deep impression upon me, which means a great deal. There are so many books I read today that I have to struggle to remember the plot or characters a week or two later. Intrigued enough to give one a try, Shelleyrae? I hope so! Love the review! I have read all his books, as I said in your previous post. I really enjoy the atmosphere, the setting, the characters, and then what puts this series in a range above most others, is the supernatural influence. Sometimes moments in the books give me a real chill! which equals delight and thrills too. Are there ghosts? I like the matter-of-fact way that Merrily has to handle this question too, along with the way certain settings and buildings do have a feeling about them. Just a wonderful series. What I love about that supernatural element is that it doesn't overwhelm the story; for the most part, Rickman lets our imaginations supply as much or as little detail as we want. If an author wants to make the hair on the back of my neck rise, when he must do is engage my imagination. Rickman knows *that* is the key!